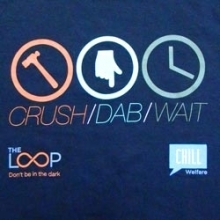 #CrushDabWait is a harm reduction campaign by the Loop and Chill which came out of our festival welfare delivery and a perceived need to promote a simple MDMA harm reduction message similar to the well known ecstasy one (take half a pill and wait for the effects before taking more). A particular concern is that the very high purity MDMA currently in circulation is leading to increased hospitalisations and deaths. But it’s difficult to calculate the doseage of crystals of varying size, purity and density, especially at clubs and festivals, hence crushing the crystals and dabbing the resulting powder can act as a rough and ready measure of a dose of about 100mg. More importantly, #CrushDabWait encourages MDMA users to engage in a simple dialogue about their drug use.